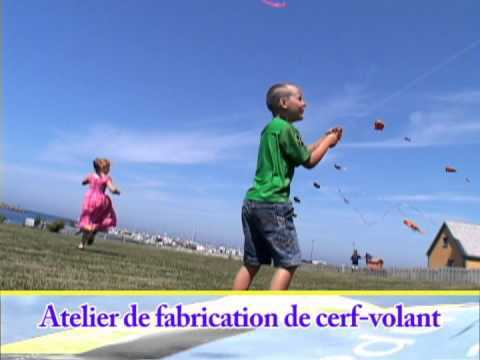 KITE BUILDING WORKSHOPS FOR CHILDREN Watch yours children's eyes light up when they hear the history of kites told in the Book of kites. Kids color, build, and assemble their master work, then add a brilliantly colored tail. Weather permitting; they will have a fine flight! While the children are learning and having fun, their parents have a full hour and a half of free time. When they are ready to leave with their creations, the kids are bright eyed and delighted. Schedule: daily at 10:00 am and 1:30 pm at SITE DE LA CÔTE. Rates: $25/child and $20, additional child from the same family. 4 years old and up. Watch your children's eyes light up when they hear the history of kites told in the Book of Kites. Kids colour, build and assemble their master work, then add a brilliantly colored tail. If weather permitting, they will have a fine flight! While the children are learning and having fun, their parents have a full hour and a half of free time. When they are ready to leave with their creations, the kids are bright-eyed and delighted. $25/child and $20 for additional children from the same family. 4 years old and up. From July 01 to August 25.